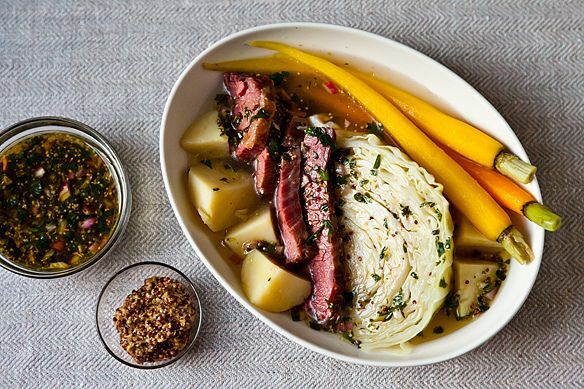 Today: A corned beef and cabbage feast that's untraditional in all the right places. Welcome to spring, St. Patrick's Day. 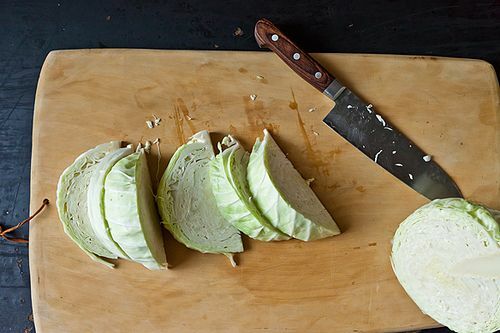 Corned beef and cabbage never really had a fighting chance. As St. Patrick's Day rolls in with the last days of winter, we're already itching for a little excitement (this might explain the green beer). By the weathered end of March, our affections for stews and rustic hunks of meat are on the wane. It's a dish that's comforting in its reverent plainness, and that's about the best it could hope for -- until now. But perhaps that's just what corned beef and cabbage was waiting for all this time: a little sunshine. 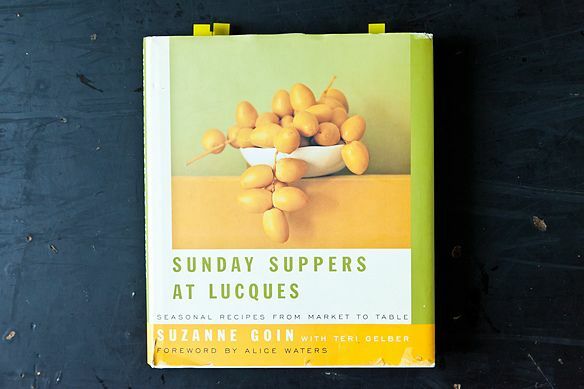 And, since Goin's version comes from Sunday Suppers at Lucques, her much-loved book of family-style menus, it's almost as easy as the old school dump-in-the-crock pot approach, with a few brilliant tweaks. First off, she treats the vegetables as equal partners. 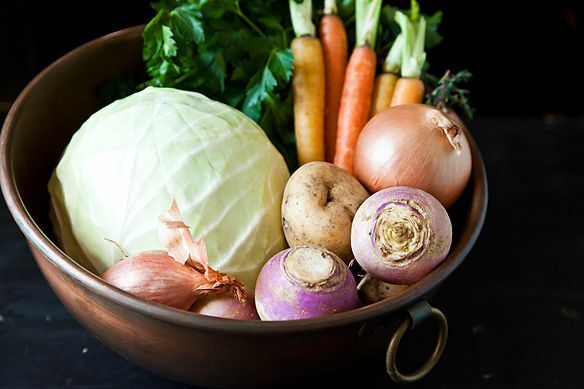 James Beard may have boiled his carrots for an hour, but modern cooks have since gotten the memo that vegetables might not be in their prime after stewing along with a salty slab of beef for so long. In fact, they are not and having surrendered their souls to the broth, they will taste of nothing but corned beef, through and through. So Goin divorces the vegetables from the meat, and they're free to cook in their own time -- that is, briefly. 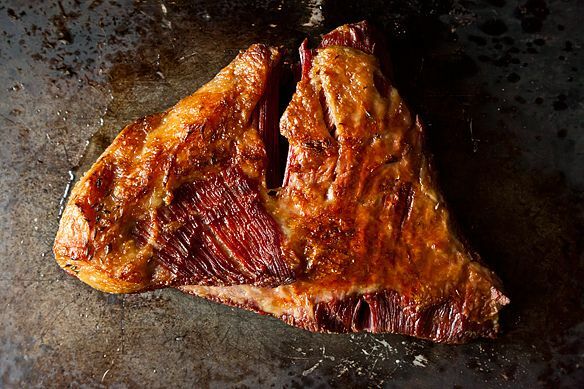 The beef will bubble merrily in the oven for hours before you even need to peel a carrot. Then out comes the beef and the vegetables go in, just for a dip. Goin isn't alone in this method, but she does clock the vegetables out in perfect time. She adds the potatoes first (because there's no such thing as an al dente potato). Then after five minutes, the rest of the team -- carrots, cabbage, and turnips -- join in to poach for about 15 minutes. They cook just enough, soaking up seasoning from the broth, but staying true to themselves. Finally, she brings in what any salty, long-cooked broth craves: a sauce that vibrates with life. 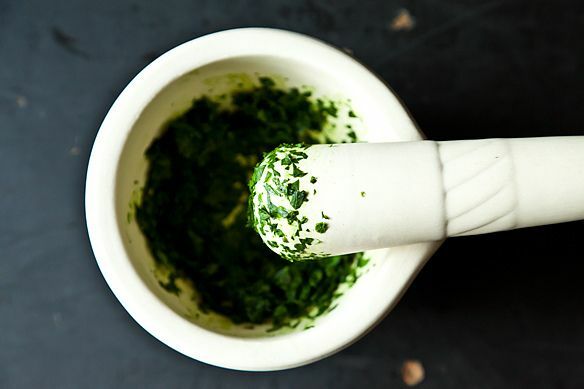 She takes a traditional corned beef condiment -- a flour-based white sauce with parsley and mustard -- and reincarnates it into an herby vinaigrette, very much like a feisty chimichurri or Italian salsa verde. 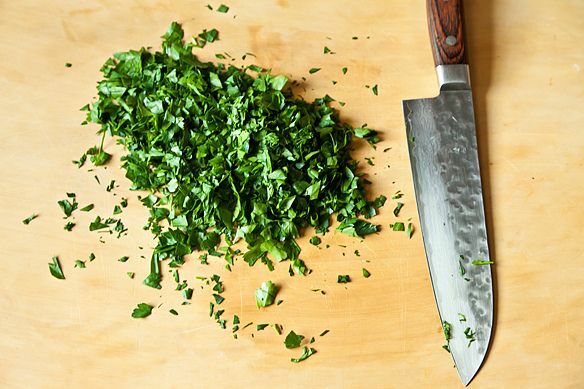 Think of what a dill pickle does for your corned beef on rye -- that's what a little vinegar does here, swirling in your soup along with sharp bites of shallot, the emerald stain of pounded parsley, and mustard seeds that slide across the meat and pop under your teeth. 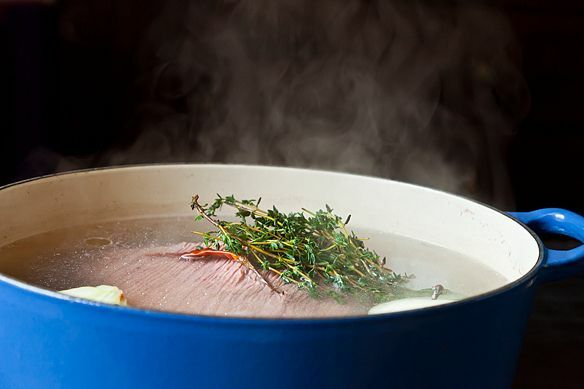 Note: If you use all-natural corned beef, or brined your own and didn't use pink salt (i.e. salt with sodium nitrite or similar), you will end up with brown, not pink, slabs of meat that will taste just as good but won't look as you remember them. I leave it up to you to decide where you fall on the nostalgia vs. nitrites spectrum. We got our corned beef from The Meat Hook, pink salt and all, and were glad we did. Made this last night with a few minor modifications. Boyfriend said it was the best corned beef he had ever had. Will now be THE way to make corned beef in this household. Thanks! I'm going to give this a try...this coming Sunday ~Potluck! Wish me luck! I've had traditional corned beef and cabbage (cooked correctly) my whole life. A friend sent me this recipe. I tried it, and it was layered with flavors! What a wonderful surprise! I'm still a huge fan of the traditional corned beef and cabbage (I think the sandwiches are best on pumpernickel rye), but I'll be adding this one to the rotation, with slightly less mustard. Thanks! Leaving a message only so I can tick the "don't e-mail me" box - receiving too much spam - sorry to trouble you further than you'll already have been! This was amazing! I bought a 4-ound corned beef brisket, learned that the secret is PLENTY of water -- definitely 6 inches over the top. The crisping made such a difference and he parsley/mustard sauce made it brighter and added the extra bit of tang to cut the richness of the beef. 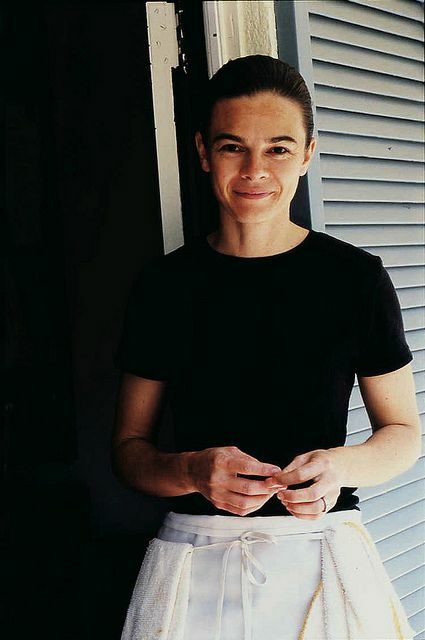 A keeper -- and not just to for St. Patrick's Day (but hey, if you're Irish, every day is St. Patrick's Day, right?). I made this yesterday. It was wonderful and easy. I will use this recipe for all future St. Patrick's Days. Amen. I did this yesterday - new to me was the sear (more for looks than flavor) and the sauce. I cook the veggies separately (personal preference) but I have kale growing in my yard so I harvested some and cooked it in the broth for a slow simmer. The kale had added flavor and no bitterness! It never fails to surprise me how simple and wonderful this meal is - shame we only seem to have it once a year. Only problem: there are never any leftovers for Reubens! Top of the morning to you all! I'm sorry, but the weary epicurean is a snob. I've lived in NY and had the "traditional" which was washed out and devoid of taste and everything tasted like corned beef, and now live in Los Angeles and have had Suzanne Goin's version which is filled with layered flavors and is delicious. The herbed mustard is fantastic and adds a bright note. Yes, the poor Irish made it one way out of necessity, but there is no reason we can't make it better because of what is available to us. That is about as a St. Patrick's dinner as you can get and very special. Now, what about the rest of the meal. Irish whiskey straight or beer and whatsare the little bits to have with drinks? Is it served with Irish soda bread or no bread. And, by gosh, what do those Irish boys have for \dessert? Irish whiskey follows; we know that. I'm going to have to demur on this recipe. The cabbage flavored with beef by boiling together with it is delicious. 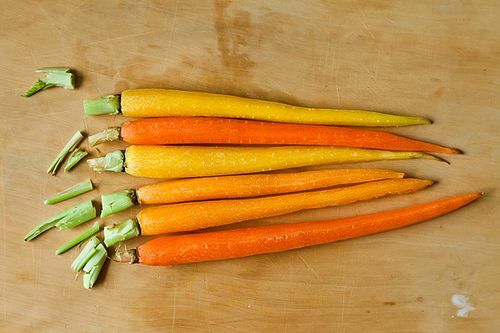 The carrot (not carrots!) is only meant to be in the pot to sweeten the cabbage - it's not even meant to be served, actually, in the traditional New York version of this dish. 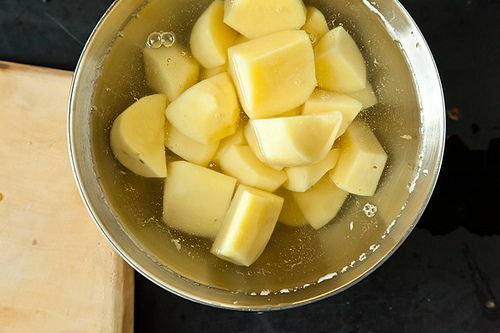 Putting mustard in your parsley sauce completely over-powers the parsley; if you prefer mustard with your corn beef and cabbage, simply serve it on the side, along with the parsley sauce, rather than mixing them to create basically mild mustard sauce. 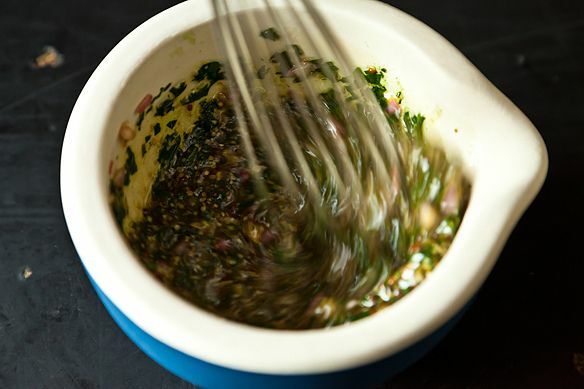 It's traditional to serve a pot of mustard with this dish by the way, just not traditional to mix them. 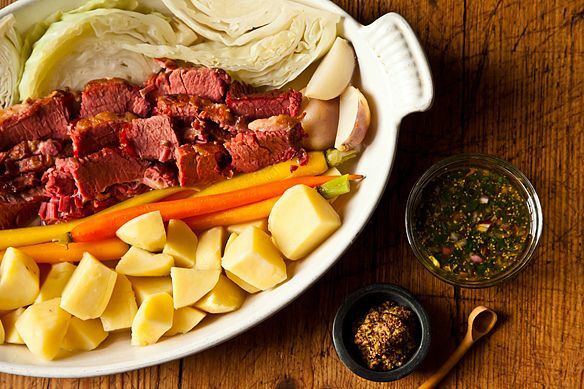 Boiling corned beef with cabbage, potatoes and a carrot in a pot as a St. Patrick's day meal is a practice that originated among homesick New York Irish. 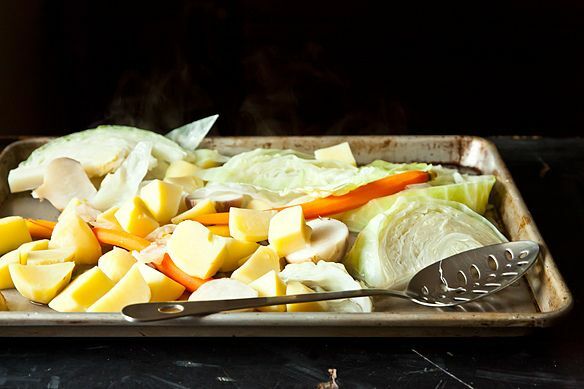 The purpose was comfort: the dish reminded them of home, where boiled bacon (not easily available on New York's kosher Lower East Side) with cabbage and potatoes was (and is) a common "special occasion" meal. "Spicing it up" undermines the entire purpose of the tradition. It's comparable to the practice of deep frying Thanksgiving turkeys: yes, turkeys are hard to roast without drying them out, but the entire purpose of the ritual is to show that you are a good housekeeper by demonstrating that you are able to do so. Essentially serving fried chicken instead misses the whole point. As a native Irish Woman.... Mmmmm Lovely ! I made this corned beef last year for St. Paddy's Day. It really is awesome. Didn't try the sauce, but it sounds very yummy. What a lovely sear on the corned beef! I think it was the dill pickle analogy that got me. We're throwing out tradition and trying this Saturday night.